Recently on a perfect Spring evening in San Francisco, we got the chance to visit a super spot, Cav Wine Bar and get to meet the winemaker for Robert Skalli Wines, Laurent Sauvage. 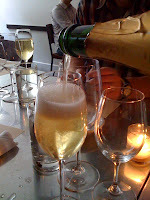 BrixChick Janesta and I met with fellow winebloggers, there where we were greeted with a sparkler, Cremant de Jura, a lovely toasty, appley palate cleanser. And then when Laurent arrived, the fireworks started with the Fortant and Robert Skalli branded wines. Sometimes French wine can all seem very expensive (damn that Euro!) and inaccessible. This was so not that wine. 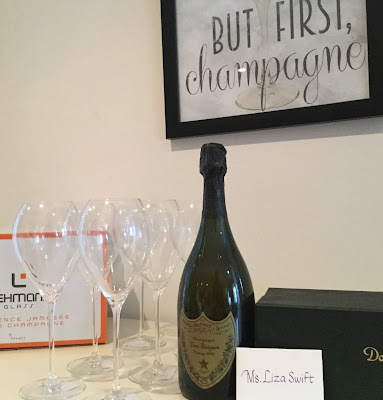 I have pages of notes documenting my surprise and delight. To start, we found out a lot about the Skalli philosophy. Going back to Robert Skalli's father Francis, who originally began producing wine in Algeria based on French varietals, then moved in the early '60's to the South of France. In the 70's Robert Skalli visited Robert Mondavi and came away inspired to drive varietal wines in the South of France in place of the traditional appellation based offerings. Today, the holdings also include the St. Supery label in Rutherford as well as Maison Bouachon in Chateau-Neuf-du-Pape. Interesting, but what was even more fascinating was the actual tasting portion. The first wine up was an `'07, Fortant Chandonnay which was unoaked and had aromas of Fuji apples and tropical and figgy flavors. And still a refreshing minerality. At only $6.99 ($6.99?!?!) it had phenomenal QPR. Grown close to the Corsican mountains, where shade and cool enable an interesting expression of Pinot Noir. Almost like a reformed bad boy, it has flavors of cherry, spices, and something slightly gamy. The flavors and mouthfeel possessed an interesting quality of freshness. '06 Fortant Merlot was delicious. No oak aging let the fruit shine through. This was a great example of the wine making philosophy where he is able to source fruit from several regions to bring together an optimal expression of the grape by selecting fruit from one region to bring freshness, another for the silky texture and another for the fruit expression. Laurent works with over 80 growers to bring this alchemy together. Again, $6.99! My note was that this would make a super "ringer" wine when blind tasting. '06 Fortant CabernetAgain, $6.99 and DELIGHTFUL!!! A little bell pepper in the nose, Fresh black currant flavors with an undercurrent of baking spice. Long, soft, subtle tannins like newborn baby starfish. '06 Robert Skalli Cabernet Sauvignon At 15.99 this tasted and smelled delicious. It had some tobacco scents and mocha notes. The flavors were lovely fruit--blueberry and a little pepper. Would be a great cheese wine. 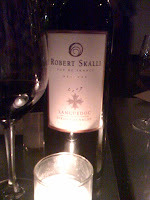 And my favorite: '06 Robert Skalli, Syrah-Grenache, Languedoc. Tia brought up the concept of "garrigue" which is a french term meaning infused with the elements of terroir, in this case, the classic south of France elements of rosemary, lavender, honey, thyme, earth, and of course the restrained use of oak, which allows that nice triumvirate of freshness, fruit and (mineral)/earth. At $18.99, still a great bargain. Many of the Skalli wines feature the image of the modern sculpture that echoes the shape of a grape vine, and also represents modern art, including the modern art of winemaking. But in this case, art that is affordable, accessible and delicious. Dazzle your friends with the French labels. Come back for the delicious taste! WHAT?!?! 6.99 french wine?!?!? I am soooo jealous! AND from Skalli? Are the gods punishing me? It really is unfair :-) Glad to hear you enjoyed them! ALL those wines were a bargain. Snap'em up if you can! Sleuth! I KNOW! I couldn't believe it. I ordered a few and plan to dazzle my friends with French wine! PS: Based on your recent hijinks I think the gods are just doing a little karma balancing. LOVE your blog!